Researchers at MIT have developed a solar cell that is much more efficient than current solar photovoltaic cells. Using nanotechnology and material technology, the new cell captures a broader spectrum of light compared to a regular solar cell and transforms these into energy. This development can increase solar power output past current efficiency limits. By adding an absorber-emitter device between photovoltaic cell and sunlight, the other undetected wavelengths of light is also converted into electricity through heat. Carbon nanotubes and photonic crystals are used as material for the absorber-emitter device. 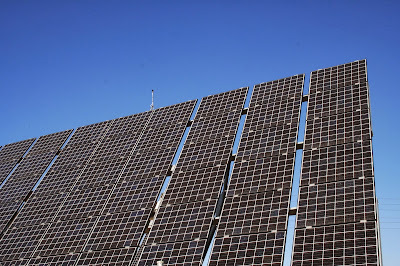 Photovoltaic cells are solid state electrical devices that convert the energy of light directly into electricity by the photovoltaic effect (using light to convert to energy). The present maximum theoretical efficiency of a solar cell is 33.70%. This is known as the Shockley-Queisser limit. With the new developed solar cell, the researchers believe once the technology is fully develop, it can break the limit and hit an efficiency rating of well over 80%. A conventional silicon-based solar cell "doesn't take advantage of all the photons," Wang explains. That's because converting the energy of a photon into electricity requires that the photon's energy level match that of a characteristic of the photovoltaic (PV) material called a bandgap. Silicon's bandgap responds to many wavelengths of light, but misses many others. This basic concept has been explored for several years, since in theory such solar thermophotovoltaic (STPV) systems could provide a way to circumvent a theoretical limit on the energy-conversion efficiency of semiconductor-based photovoltaic devices. That limit, called the Shockley-Queisser limit, imposes a cap of 33.7 percent on such efficiency, but Wang says that with TPV systems, "the efficiency would be significantly higher — it could ideally be over 80 percent." The design of the two-layer absorber-emitter material is key to this improvement. Its outer layer, facing the sunlight, is an array of multiwalled carbon nanotubes, which very efficiently absorbs the light's energy and turns it to heat. This layer is bonded tightly to a layer of a photonic crystal, which is precisely engineered so that when it is heated by the attached layer of nanotubes, it "glows" with light whose peak intensity is mostly above the bandgap of the adjacent PV, ensuring that most of the energy collected by the absorber is then turned into electricity.